Last week, we gave you an update in particle physics. This week it’s time to see what’s new in the world of dark matter. Spoiler alert, we still have no idea what it is, but maybe a few more ideas for what it isn’t. For decades, the predominant cosmological model used by scientists has been based on the theory that in addition to baryonic matter – aka. “normal” or “luminous” matter, which we can see – the Universe also contains a substantial amount of invisible mass. This “Dark Matter” accounts for roughly 26.8% of the mass of the Universe, whereas normal matter accounts for just 4.9%. 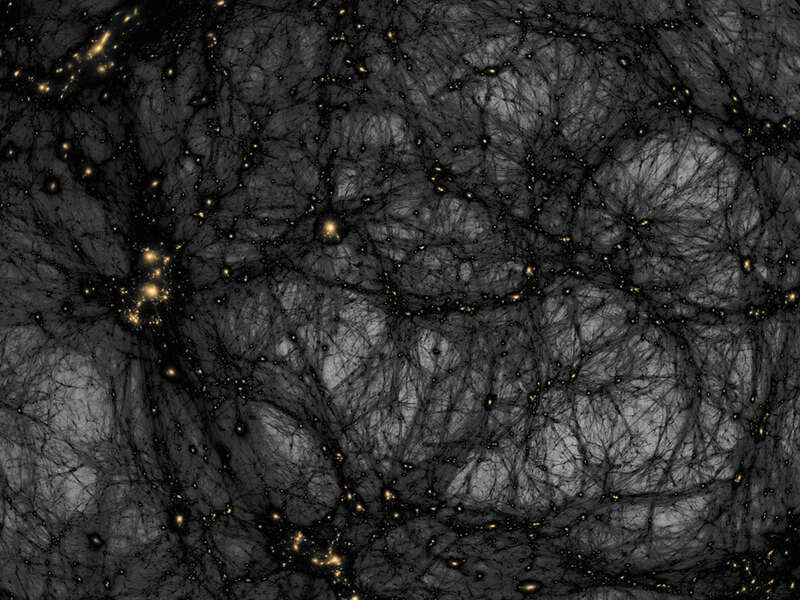 While the search for Dark Matter is ongoing and direct evidence is yet to be found, scientists have also been aware that roughly 90% of the Universe’s normal matter still remained undetected. According to two new studies that were recently published, much of this normal matter – which consists of filaments of hot, diffuse gas that links galaxies together – may have finally been found. The first study, titled “A Search for Warm/Hot Gas Filaments Between Pairs of SDSS Luminous Red Galaxies“, appeared in the Monthly Notices of the Royal Astronomic Society. The study was led by Hideki Tanimura, a then-PhD candidate at the University of British Columbia, and included researchers from the Canadian Institute for Advanced Research (CIFAR), the Liverpool John Moores University and the University of KwaZulu-Natal. The second study, which recently appeared online, was titled “Missing Baryons in the Cosmic Web Revealed by the Sunyaev-Zel’dovich Effect“. This team consisted of researchers from the University of Edinburgh and was led Anna de Graaff, a undergraduate student from the Institute for Astronomy at Edinburgh’s Royal Observatory. Working independently of each other, these two team tackled a problem of the Universe’s missing matter. Based on cosmological simulations, the predominant theory has been that the previously-undetected normal matter of the Universe consists of strands of baryonic matter – i.e. protons, neutrons and electrons – that is floating between galaxies. These regions are what is known as the “Cosmic Web”, where low density gas exists at a temperatures of 105 to 107 K (-168 t0 -166 °C; -270 to 266 °F). For the sake of their studies, both teams consulted data from the Planck Collaboration, a venture maintained by the European Space Agency that includes all those who contributed to the Planck mission (ESA). This was presented in 2015, where it was used to create a thermal map of the Universe by measuring the influence of the Sunyaev-Zeldovich (SZ) effect. This effect refers to a spectral distortion in the Cosmic Microwave Background, where photons are scattered by ionized gas in galaxies and larger structures. During its mission to study the cosmos, the Planck satellite measured the spectral distortion of CMB photons with great sensitivity, and the resulting thermal map has since been used to chart the large-scale structure of the Universe. However, the filaments between galaxies appeared too faint for scientists to examine at the time. 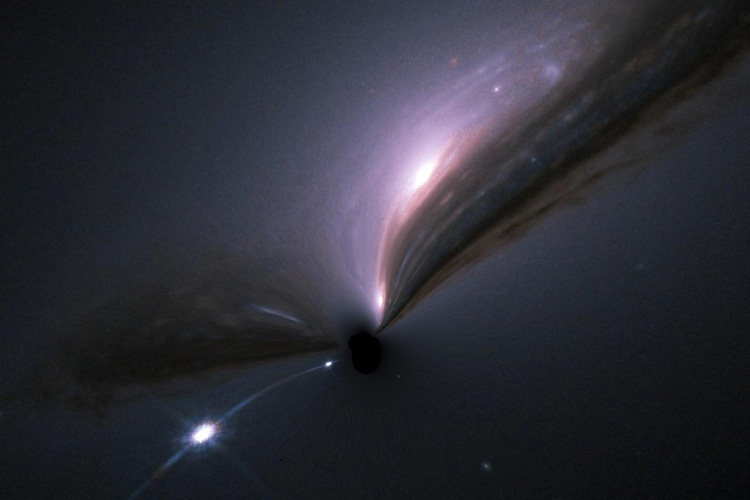 To remedy this, the two teams consulted data from the North and South CMASS galaxy catalogues, which were produced from the 12th data release of the Sloan Digital Sky Survey (SDSS). From this data set, they then selected pairs of galaxies and focused on the space between them. While Tanimura and his team stacked data from 260,000 galaxy pairs, de Graaff and her team stacked data from over a million. In the end, the two teams came up with strong evidence of gas filaments, though their measurements differed somewhat. Whereas Tanimura’s team found that the density of these filaments was around three times the average density in the surrounding void, de Graaf and her team found that they were six times the average density. This particular aspect of particularly interesting, in that it hints that over time, baryonic matter in the Cosmic Web has become less dense. Between these two results, the studies accounted for between 15 and 30% of the total baryonic content of the Universe. While that would mean that a significant amount of the Universe’s baryonic matter still remains to be found, it is nevertheless an impressive find. It also opens up opportunities for future studies of the Comsic Web, which will no doubt benefit from the deployment of next-generation instruments like James Webb Telescope, the Atacama Cosmology Telescope and the Q/U Imaging ExperimenT (QUIET). With any luck, they will be able to spot the remaining missing matter. Then, perhaps we can finally zero in on all the invisible mass!